The attractive city of Chichester, featuring a magnificent cathedral, Roman walls walk and internationally renowned Festival Theatre (25 minutes). The seaside town of Bognor Regis, sunshine capital of UK and home to Butlins which welcomes day visitors (10 minutes). Comprehensive guide to over 50 Top Attractions in the sunny county of Sussex by the sea. Useful links to what's going on in and around Bognor Regis. 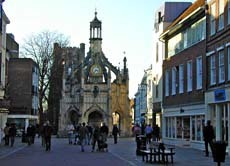 The Official Tourism website for Chichester and its District. A complete information guide to Arundel, a unique and historic market town.